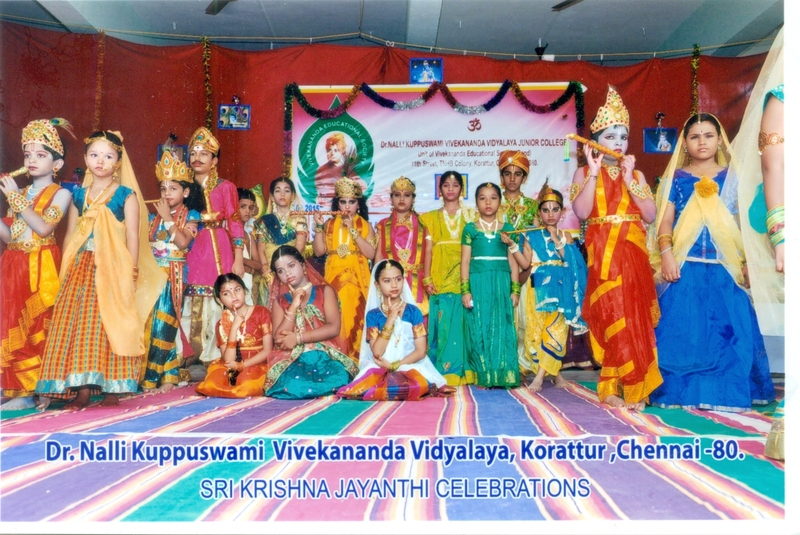 Sri Krishna Jayanthi was celebrated on 06.09.2018. Smt. 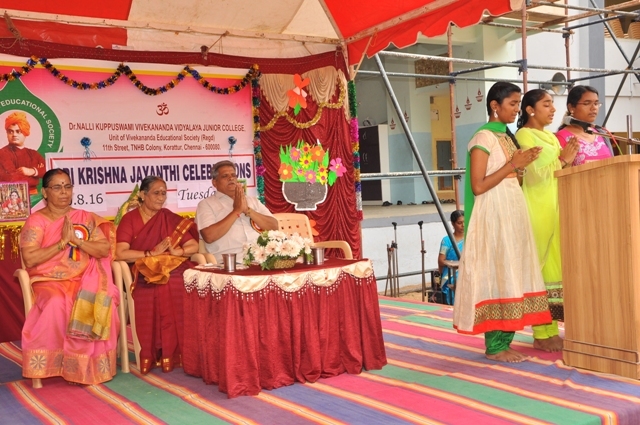 Manonmani Rajeswari, Senior Vocalist was the Chief Guest. LKG to II Std. students dressed up like Krishna and Radha. III to V Std. presented Kolattam, VI to VIII Std. students - Dance, IX & X - Bhajan, XII Std. in Uriyadi. 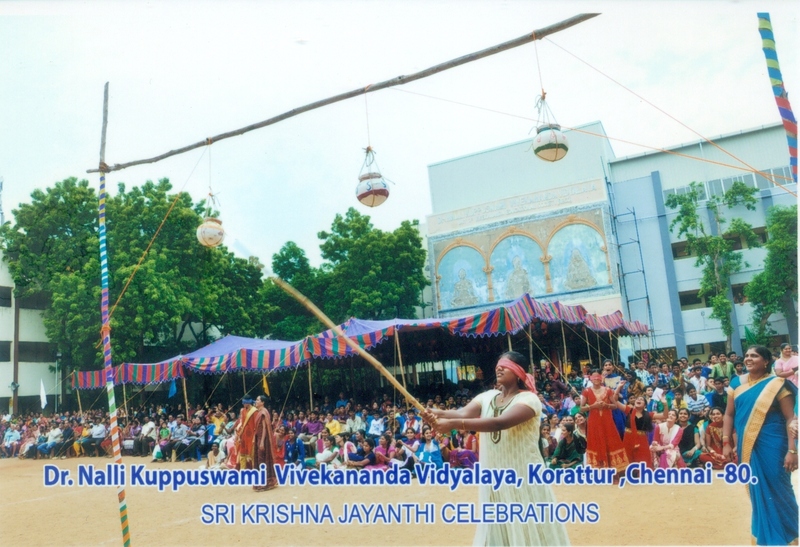 Sri Krishna Jayanthi was celebrated on 11.08.2017 in a grand manner. Sri. Raman, President, Korattur Cultural Academy and Smt. 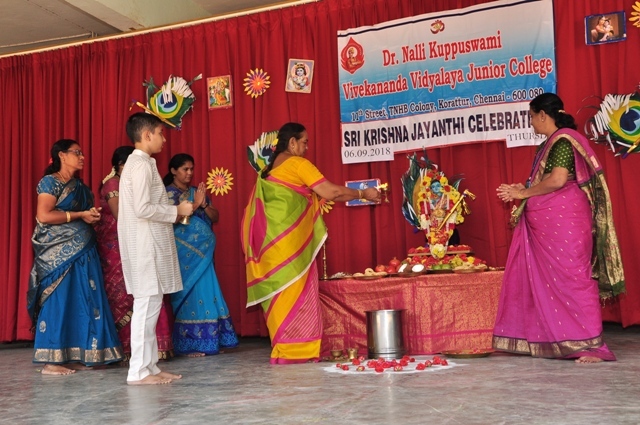 Vasanthi Murali, Vishnu Sahasranama Mandali graced the occasion. 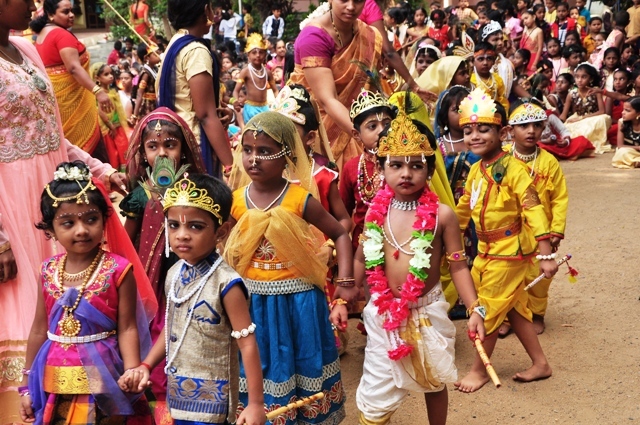 LKG to II std students dressed up like Krishna and Radha. 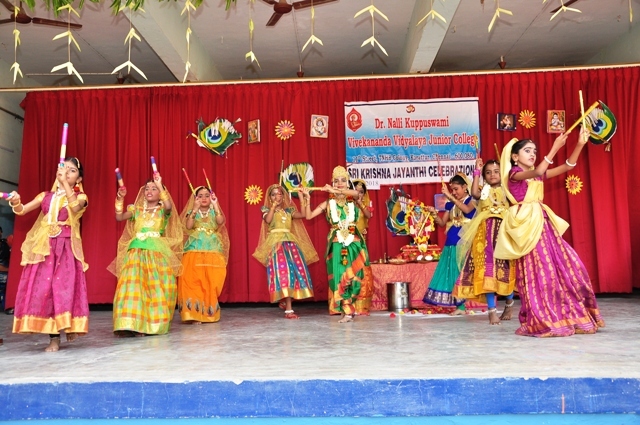 Students performed dance, kolattam and took part in Uriyadi. 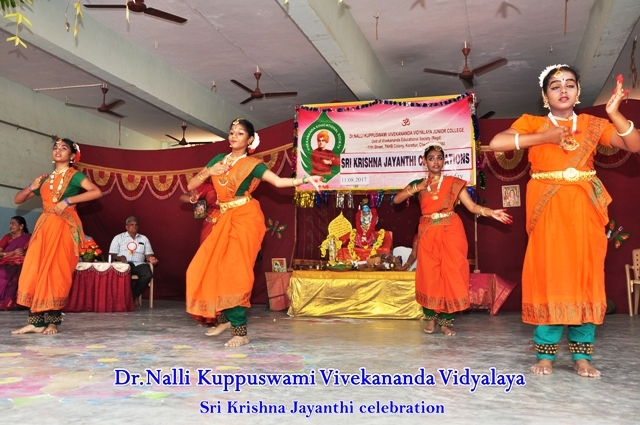 Sri Krishna Jayanthi was celebrated on 29.08.2016 in a grand manner. Smt. 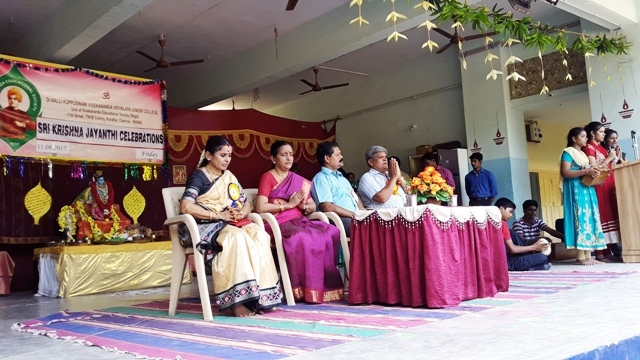 S.S. Tharini, Former Principal of Ambattur unit, Former Education Officer of VES was the chief guest. Our Additional Correspondent Sri. P. Kesavanji and Smt. Pushpa Kesavan, Smt. Vanaja, Sri. Janakiramanji, SMDC member graced the occasion. 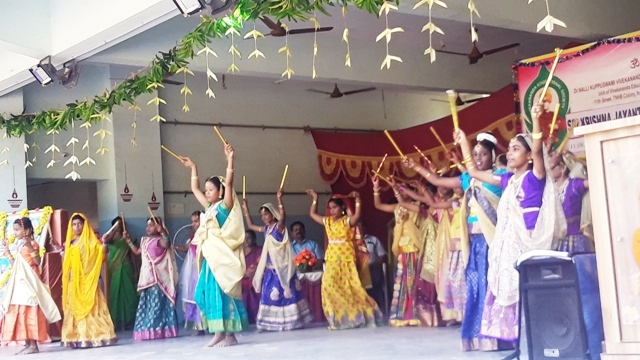 LKG to II std students dressed up like Radha and Krishna, Primary children performed Kolattam, Middle level students performed Dance Drama based on the theme “Sri Krishna”, High school level children rendered Bhajan and Higher secondary students performed Uriyadi. 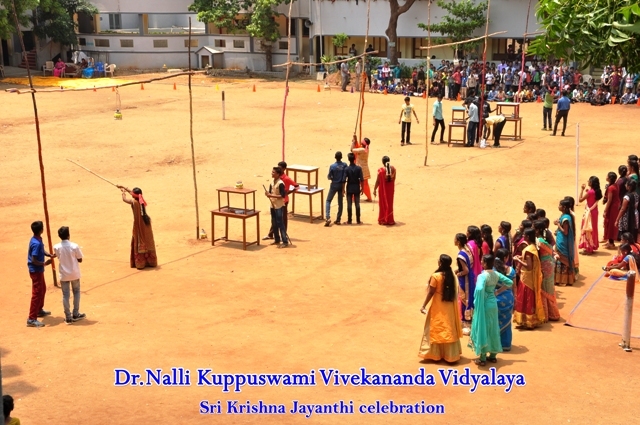 Sri Krishna Jayanthi was celebrated on 09.09.2015 in a grand manner in our school premises. Br. Amaresh Chaitanya, Chinmaya Mission offered benediction. 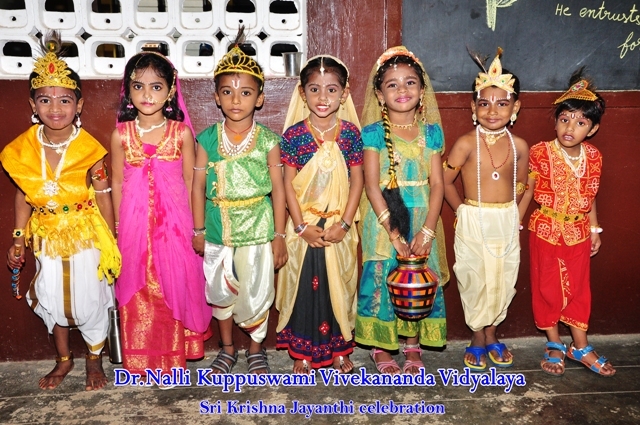 Pre-primary children dressed up like Radha & Krishna. 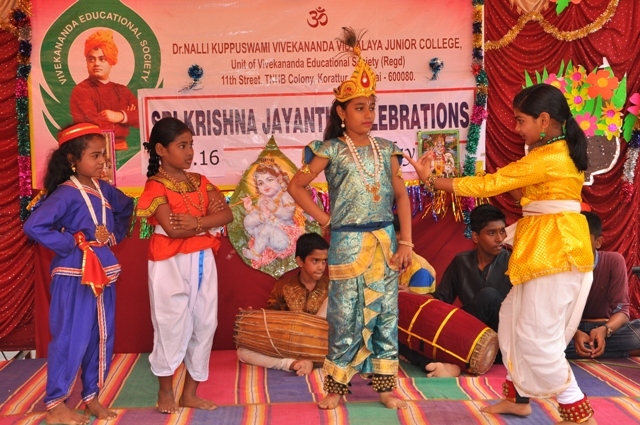 Primary children rendered Krishnashtagam, middle level students performed bhajan and Pinnal Kollattam. 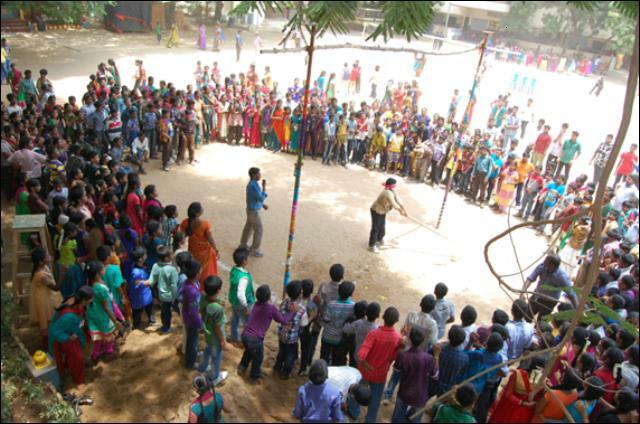 IX to XII std students participated in Uriyadi. Followed by this was the speech by Swamiji on the topic “Krishna as an ideal student”. XI and XII std students were the participants for this programme. 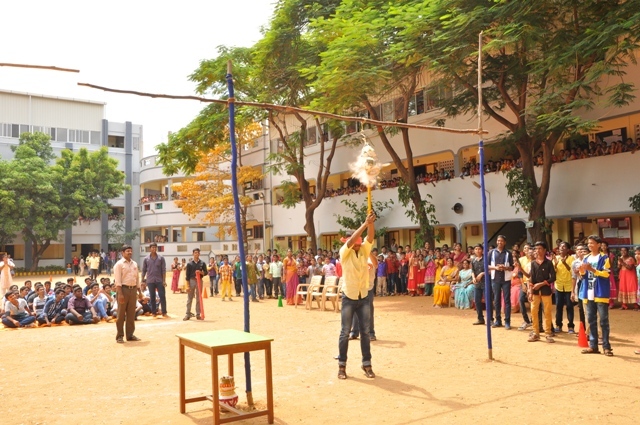 Gokulashtami was celebrated in our school in a grand manner. Sri. Somanathanji, Treasurer, VES and Smt. PushpaKesavan attended the programe and blessed the children. *Pre-primary children dressed like Radha and Krishna. 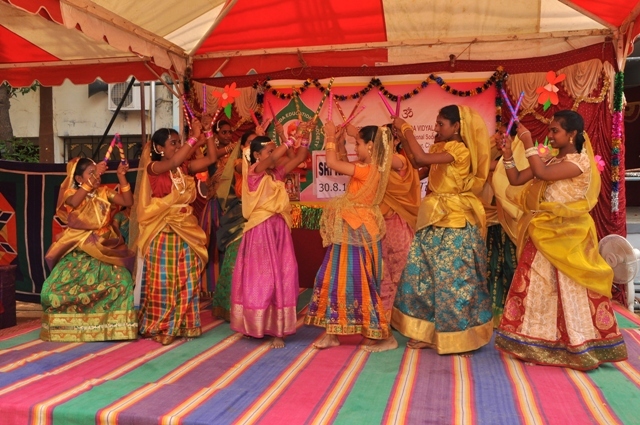 *Primary children gave a dance programme (Kollattam). 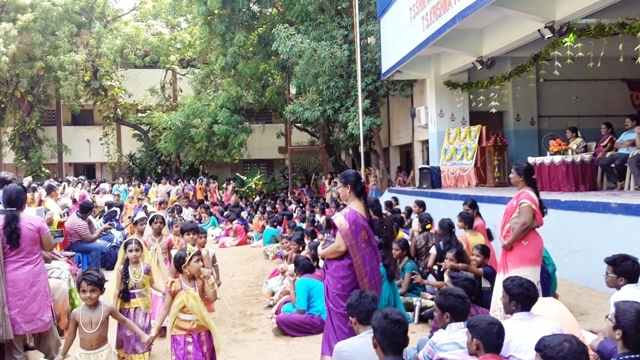 * VI to VIII std students performed Bhajan and IX and X std students participated in Uriyadi. 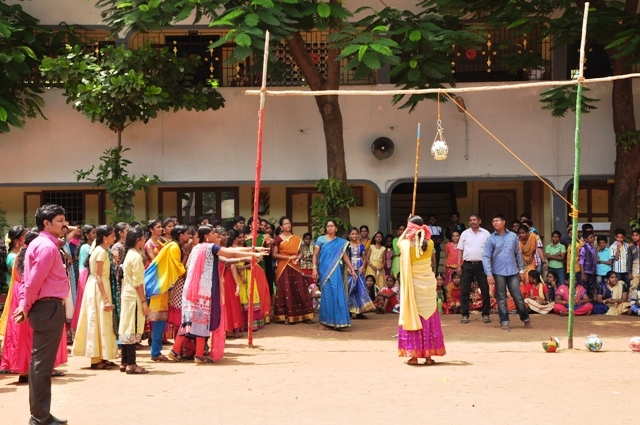 Gokulashtami was celebrated on 08.08.2012 with pomp in our school. Our Pre Primary students participated and celebrated the function. Our Additional Correspondent Sri. P. Kesavanji and Smt. Pushpa Kesavan graced the occasion. Sloka recitation, Group song, Dance (Kolattam), storytelling by our teacher Smt. Aruna comprised the cultural events. Our Tamil teacher Sri. 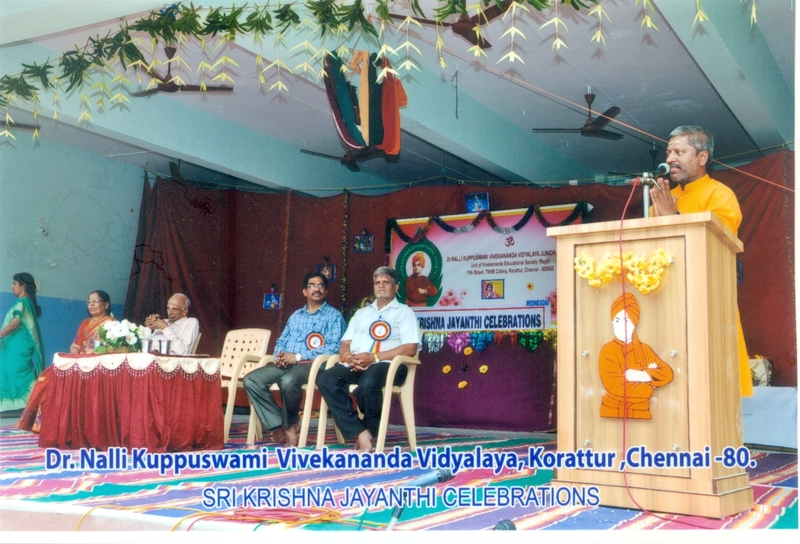 E. Ramesh spoke about the significance of Krishna Jayanthi in the morning assembly. 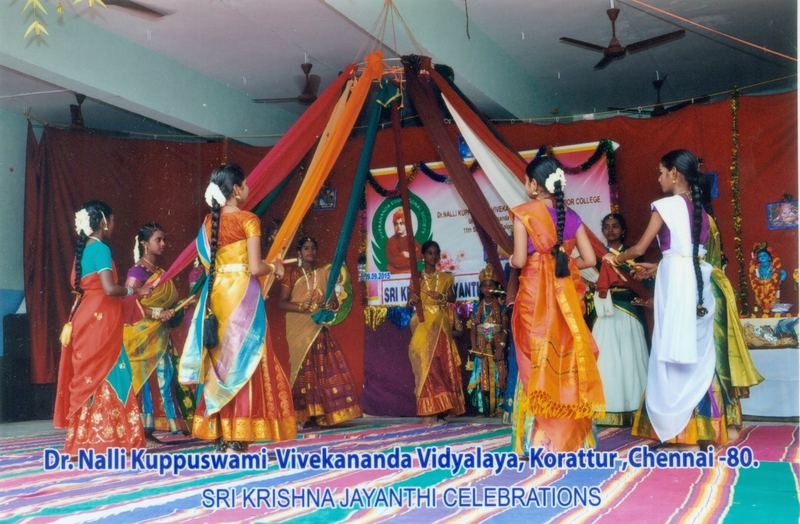 Sri Krishna Jayanthi was celebrated in a grand manner in our school premises. Br. Amaresh Chaitanya, Chinmaya Mission offered benediction. 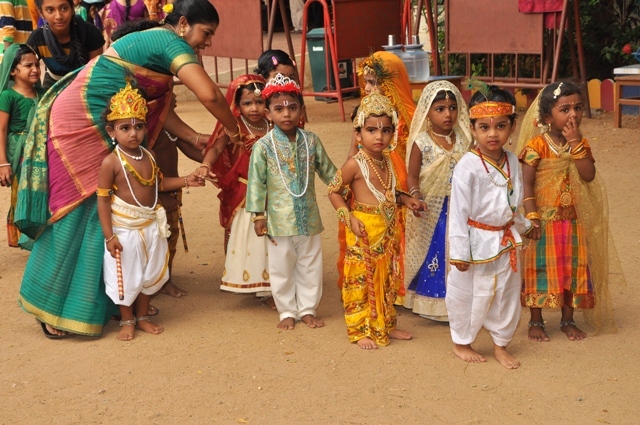 Pre-primary children dressed up like Radha & Krishna. 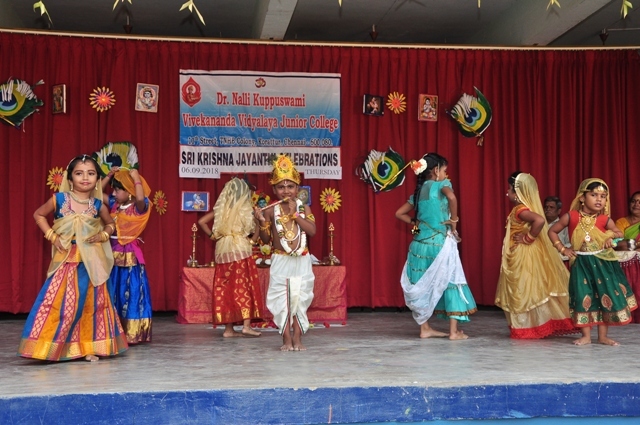 Primary children rendered Krishnashtagam, middle level students performed bhajan and Pinnal Kollattam. IX to XII std students participated in Uriyadi. Followed by this was the speech by Swamiji on the topic “Krishna as an ideal student”. XI and XII std students were the participants for this programme.